Dental bonding is a treatment that involves applying a tooth-colored composite resin (plastic) to a tooth. It’s a simpler, less expensive treatment option than getting veneers, since it can usually be completed in one visit. Bonding is made from the same material (composite) as a filling and can also be referred to as a filling. After your dentist applies the material to your tooth or teeth, it’s hardened with a special light that makes the resin adhere to the tooth. Why would someone need dental bonding? This versatile treatment provides cosmetic benefits by improving the appearance of your smile, and it can also help restore the good condition of damaged teeth. Versatility – They can be used to correct a variety of issues to restore a tooth’s function or improve its appearance. Natural-looking appearance – The color of the resin can be matched to your tooth’s color, creating a natural appearance. It’s also polished to match the sheen of your surrounding teeth. No preparation needed – No preparation is needed before your bonding, and anesthesia usually isn’t needed. Cost – Unlike veneers, which require creating a mold that’s used to make the veneers in a laboratory, dental bonding is much less expensive. Speed – If you’re having bonding performed on one tooth, it generally takes about 30 minutes or an hour to complete your procedure. 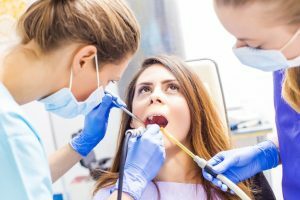 Virtually no special after-care – After your treatment, you’ll just need to avoid tooth-staining substances like coffee for about two days and then maintain a good at-home oral hygiene program, combined with regular dental cleanings. Your dentist will choose a composite resin color to closely match the color of your tooth. Your tooth will then be slightly roughened and coated with a liquid that helps the bonding material adhere to it. Your dentist will then apply the resin to your tooth, molding and smoothing it until it’s the right shape. A special light will then be used to help harden your tooth. Afterward, you’ll need to avoid substances that could stain your bonding for about 48 hours. These include coffee and tea as well as cigarettes. Regular brushing at home and regular cleanings by a dental hygienist are all that’s needed to maintain your bonding. If you’d like to find out if dental bonding could be right for you, contact us today or stop by one of Dental365’s many New York metro locations today. Our state-of-the-art offices are open seven days a week with extended hours on weekdays for your convenience. Fill out the form on this page to request an appointment or call 844-365-DENTAL to learn more.